Welcome to the world of Apparel Search. On this page you will find a brief introduction to our website as well as a few key access points to our industry. If you work in the garment industry you are welcome to further explore the Apparel Search fashion website. In summary, Apparel Search is a garment & textile industry directory which provides members of the fashion industry with educational information regarding virtually every aspect of the apparel business. If you are interested in researching various elements of fashion, fabrics, clothing, or related products & services, you have found the proper place. Although we do not currently publish glamorous magazines or create prime time television shows about fashion, we are technically a fashion media company. As such, the Apparel Search Company has been developing fashion portals for more then a decade. By far, our largest and most significant work to date is the ApparelSearch.com directory (the site you are currently visiting). In addition to the Apparel Search directory, we also pride ourselves in the fact that we moderate the Fashion Industry Network community. FIN is one of the worlds leading business to business social networking websites devoted specifically to members of the fashion industry. Our apparel media company also owns and operates the Fashion Newspaper which provides the industry an additional outlet for reading fashion news from around the globe. The Apparel Search Fashion Directory is essentially an all encompassing guide that has originally been designed to educate members of the fashion industry. Over the years as the site developed, we have learned that although we originally intended to assist only our industry, we have inadvertently helped consumers as well. According to industry pundits, Apparel Search is an excellent resource for helping members of the clothing industry as well as retail consumers. Based on our current estimations, our research tools & guides are approximately 85 percent geared toward the apparel industry and roughly 15 percent toward fashion consumer relevancy. Although our primary focus is on tools to aid the industry, we have an extremely large volume of fashion consumers browsing through our pages. The following are a few sectional examples of our business to business directory that have inadvertently become beneficial tools to consumers as well as the industry. Fashion Trend Reports : Despite the fact that our fashion trends & forecasting section is classified as a business tool, we have found that consumers of fashion also find our research to be helpful. Good luck with finding a consumer that is not interested in the latest styles and fashion trends for the coming season. Fashion Boutique / Clothing Store Directory : Our retail directory has been created to help clothing wholesalers (distributors, manufacturers, production agents, etc.) locate clothing retailers so that they can conduct business with one another. However, in addition to being a retail buyers guide, our clothing stores directory has also clearly become a favorite for consumers searching for new and exciting shopping experiences. As new boutiques or department stores add their information, this provides consumers with new places to shop. Fashion Blog Directory : When blogging about fashion first came on the scene, Apparel Search was one of the first companies to create a directory of the fashion blogs. We did this to help blog authors find a place to call home on the internet. Sure, their own blog was their actual home, but how could people find them easily. Apparel Search made it a bit easier for independent fashionistas and street bloggers to be found. Although our guide started as a service to assist bloggers, the directory turned out to be beneficial for "consumers" that were interested in tracking style trends, sales events, color forecasting, etc. As we have all learned, the fashion blogs are great resources for learning about new designers and their collections. It is no secret that the blogging community loves to write about fashion week and other special events. These are great opportunities to track fashion celebrities, designers, and new collections all at one time. Great for the industry, and great for shoppers. Fashion News : The Apparel Search fashion news section has originally been designed to provide fashion industry news in a timely manner so that members of the garment industry could stay up to speed on what is happening in the industry. Over the years, we have fined tuned our news resource to include shopping news as well. We believe that our fashion news should educate both the industry and consumers. Fashion Jobs : The beauty about our fashion jobs section is that it is beneficial to people that are currently employed in the worlds greatest industry. And at the same time, it helps our industry grow. This section of our site is clearly helpful to people in the industry and people that wish to be in the future. The goal of Apparel Search is to provide a simple and convenient way for all people to learn about every known aspect that is relevant to clothing and textiles. This includes the entire product life cycle starting from the textile fiber all the way to a finished garment hanging in the window of a fashion boutique. Our aim is to assist viewers by educating them about fashion design, apparel manufacturing, wholesaling & distribution of clothing, retailing and every element in between. In addition to learning the big picture fundamentals about fashion, clothing & fabrics we will educate visitors regarding each and every minor process involved in producing, marketing, and selling these items. For example, if you are interested in the process of manufacturing clothing, you can visit our clothing manufacturer section. In that particular area of our directory, you will have the opportunity to learn about fibers, fabrics, sewing facilities, CMT factories, trims & notions suppliers, garment printers, embroiderers, and more. Regardless of whether or not you are looking to find clothing factories around the international clothing suppliers from world to produce the full package, or if you are in search of trimming such as buttons, zippers, threads, woven labels, hangtags, or waistband elastic, you can find the items in our apparel manufacturers directory. If you are a new fashion designer or a very experienced veteran, you may need help locating new printers, dyers, or embroiderers for your collection. In addition to the areas listed above, our garment manufacturing guide can help you find contractors to assist with printing, embroidering, dyeing, finishing, etc. In addition to the manufacturing sections described above, we have extensive resources to assist retailers, wholesalers, stylists, models, fashion photographers, and fashion industry consultants as well. Regardless of which area of the industry you specialize, we most likely have tools to assist you with your daily routine. As you progress through our directory, you will discover that we also wish to give you an education in regard to consulting, licensing, fashion technology and more. If you enjoy the technology behind fashion, you may enjoy checking out some of the fashion tech directories full of suppliers that can assist you with PDM, PLM, CAD, SCM, EDI, ASN's etc. Some of our more fashionable categories include our trade shows directory, trend forecasting guide, hair stylist directory, modeling agency list and several other exciting classification. As mentioned above, although we are a business to business resources, we also have a few sections that may assist consumers of clothing & fashion accessories. For example, you will find a clothing store section and our shopping area that is beneficial to both the garment industry as well as shoppers. When utilizing our b2b directory, you will discover several ways to locate information. The primary method is to use the category structure that you will see after entering the site. We have segments of the industry categorized for your convenience. Modeling agencies, clothing wholesalers, apparel retailers, financial information about clothing companies, fashion trade shows, and much more. In addition to our fashion industry directory structure, we have a search function that will allow you to search all of the Apparel Search Company websites from one engine. 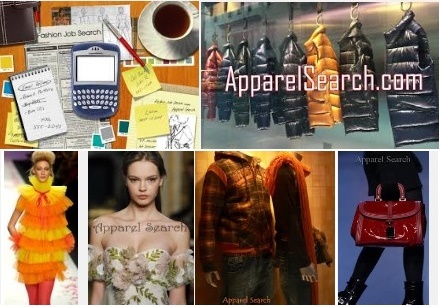 In our opinion, Apparel Search is the best clothing industry b2b guide in the universe... If you enjoy fashion or are a member of the apparel industry, the Apparel Search guide to fashion is the stylish place for you to begin your search for the latest fashions. Please take your time to search the Apparel Search website. Have fun and get started finding information about fashion and the apparel industry. If you start getting lost, you can find link back to the home page from any page on our site. You can also try the Apparel Search Table of Contents if you think that may help guide you. Whether you are an experienced garmento or simply an aspiring fashion designer, the Apparel Search directory will provide you with the tools you need to be successful. Do you know what Jobbers are used for? Do you have closeout clothing inventory that you need out of your warehouse? Are you eager to have a pattern maker, production agent, or merchandise manager that is worth their weight in gold? On this site you will hopefully find the resources to assist you. Apparel Search is one of the first and largest online guides to the Apparel & Textile Industry. Our company provides excellent resources that assist fashion industry professionals in efficiently and effectively completing daily tasks. ApparelSearch.com is committed to maintaining its leadership role in the Apparel Industry. Maintaining top position will be achieved through continued financial re-investment as well as immense dedication to the content of the site . Due to our willingness to re-invest resources, we will continue to outperform all industry standards. Apparel Search visitors include retailers looking for new wholesalers, vendors looking for new factories, factories looking for new fabric suppliers, traffic managers looking for freight lines, company owners looking for factors, production managers looking for testing labs, sales managers looking for buyers, marketing managers looking for a "great place to advertise" (like here!). The list goes on and on until it touches every aspect of the apparel industry. If you would like to learn more about the Apparel Search Company, you are welcome to visit our about us area for additional information. From there, you can learn about our company, services, and fashion websites. For those of you that are too busy to spend time reading the "about us" section, here is a brief description of who we are and what we do. The Apparel Search Company is a fashion media organization that utilizes several of it's wholly owned internet properties to assist members of the clothing industry as well as consumers of fashion. Our websites help viewers research numerous fashion relevant topics. For example, we assist with locating clothing factories, fashion boutiques, fashion wholesalers, consulting services, trend services, modeling agencies, and much more.